Nazanin Shahrokni, left, listens as Jaleh Shaditalab, a founding member of the Tehran University Centre for Research on Women from Iran, shares her thoughts on how peace in the Middle East can be achieved at the Nov. 23 conference. Women’s ideas could go a long way in improving the lives of those suffering in war-torn countries, but rarely do they see the light of day in the peace negotiation process. The best way to make sure peace is never achieved is only to talk to the men with guns, Concordia anthropology professor Homa Hoodfar told audiences at a conference recently. Disarmament is often confused with peace, but a lack of guns does not translate to better lives for women and children living in areas ravaged by war. Activists, researchers and academics from Iran, Afghanistan and Canada came together Nov. 23 to discuss the exclusion of women from the peace-making process and the impact of U.S. foreign policy on women in Afghanistan and Iran. Called Women and the Struggle for Peace in the Middle East, the conference was sponsored by the Simone de Beauvoir Institute, the Concordia Peace and Conflict Resolution series and Alternatives. It was organized by Simone de Beauvoir Institute professor Dr. Roksana Bahramitash, and was six months in the making. As part of Hoodfar’s research in Afghanistan, she visited 450 women in their homes to find out what they thought peace would look like in their country. Women overwhelmingly responded that as long as their primary needs, such as food, employment and education, were not being met, peace could never be a reality. “As long as you don’t have bread on the table, you are never going to have peace,” Hoodfar said. Jaleh Shaditalab, a founding member of the Tehran University Centre for Research on Women from Iran, shared her insights on how peace could be achieved. “More democracy and fewer terrorists will not result from any war,” Shaditalab said. The economic fallout that comes with war affects women most harshly, so women have a legitimate claim to being included in the process. Women’s exclusion and their relationship with foreign governments and agencies are highly problematic, especially when the latter claim to be on a mission to save women. In reality this is not the case, Bahramitash said. Missing from the conference was Shahla Abawi, a member of the Afghan Housewives Organization, who is from Afghanistan. She was not issued a visa by the Canadian consulate, preventing her from sharing her experiences of community organizing both under the Taliban and the current civil conflict. Shaditalab was almost unable to attend, but fortunately she received her visa in the days leading up to her departure from Iran. 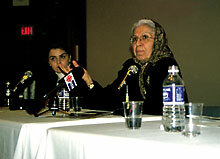 Bahramitash believed Abawi’s absence deprived conference attendees of the opportunity to understand Middle Eastern women’s lives outside of stereotypes. The conference demonstrated that like democracy, feminism cannot be exported but must grow from within. The second part of the Women and the Struggle for Peace in the Middle East conference will feature Iraqi Jewish filmmaker Ella Shohat, and will take place in March. For more information, contact Roksana Bahramitash at rbahramitash@hotmail.com or 848-2424 ext. 2372.